This Italian Pasta Fagioli Recipe is easy and cheap to make. It is a comfort food that is served in many Italian restaurants. This recipe is an outstanding version using Cannelloni Beans and Pipette Pasta. This Italian Pasta sauce made with roasted Cherry Tomatoes, Garlic, Basil, and Oregano was so delicious . This sauce took 5 hours to roast and worked great on the Gragnano Brand Linguine made in Italy. The sauce was nice and sweet and the flavor of the Asiago Cheese and Parmesan made this Italian recipe a winner. The Bald Chef shows you how to make a homemade recipe for Cherry Tomatoes called Pomodoro Sauce. Italian Mussels Marinara Recipe shows you how to make Italian Mussels Marinara Recipe. If you are a seafood lover and you love Mussels.Italian Mussels Marinara Recipe might be for you. I will show you step-by-step how to make this recipe straight out of Italy. I start by using organic Rhode Island mussels that I thoroughly wash and clean. These Muscles are steamed in a broth of Butter, White Wine, and crushed Garlic. I cook fresh egg linguine al dente, and drain the water to create the perfect plate of pasta. After the Mussels have opened up I top them with the best Italian Marinara Sauce. This seafood sauce is been crowned over fresh linguine pasta. The final results are a restaurant quality mussels marinara that you would be proud to serve at any dinner party, are to your family. This is a very easy Italian recipe to put together and in my personal opinion I truly think you would enjoy it. This is The Bald Chef’s recipe for Italian Mussels Marinara. To successfully cook and prepare this recipe for mussels marinara one must be extremely careful in purchasing the mussels for the recipe. The muscle you will be using will be alive and must be fresh for this recipe will be a failure. I highly recommend using organic Rhode Island mussels to make this recipe perfect. Once you have obtained your fresh mussels one must take care in a washing and cleaning any sand or a residue that is on the mussels. In a large stock pot place 3 tablespoons of butter on medium high heat and melt butter, add the 4 cloves of crushed garlic and let the garlic cook and infuse its oils and flavors into the butter. Add 1/2 cup of water and 3 tablespoons of olive oil place the Mussels into the pot and place the lid on to the pot. 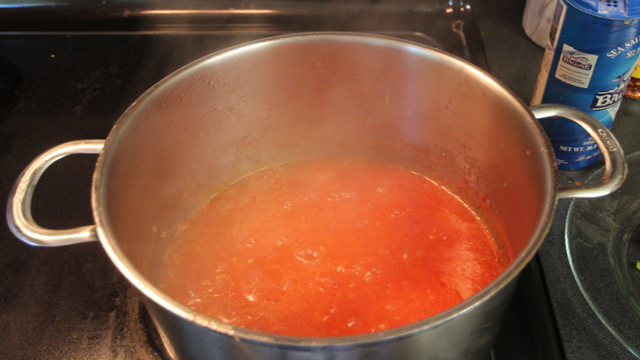 In a separate stockpot bring 2 quarts of water to a rapid boil and add a pinch of salt and a tablespoon of olive oil. When the water comes to a rapid boil and cook your fresh egg linguine to the manufacturers recommendations. When your mussels have steamed for about 10 to 15 minutes all of your mussel shells should be open. The next step is to add your one cup of Italian marinara sauce stir the mixture and place the lid back on the pot and let the mussels rest in the sauce for 1 minute. Plate up your egg linguine and crown it with your Italian Mussels Marinara sauce. Enjoy this recipe and I do believe you will find it to your liking. The flavor of this recipe comes from the olive oil, garlic, clams, and parsley. Serve this dish on fresh egg linguini, and you will love this recipe from the Bald Chef. The first step in cooking Italian White Clam Sauce With Linguini is to add to a stock pot add 2 tablespoon Extra Virgin Olive Oil, bring the oil up to heat and add 2 tablespoons of crushed Garlic. Infuse the garlic flavor into the oil by cooking it for about 1 minute. Add to the oil 5 rounds of Black Pepper, and 1 Tablespoon Sea Salt. Then add 1 can of chopped Clams with the liquor and ¼ cup Italian Parsley. In Your large stock pot and add 1/2 cup of Italian Marsala Wine, bring to a boil, Add the 24 Little Neck Clams, and steam the Clams until they open. Prepare your 16 oz of fresh Egg Linguini pasta. Drain the Egg Linguini and top with the Italian White Clam Sauce. Then I like to add a pinch of Italian Parmesan cheese and a couple rounds of Black Peper. Though many Italians would say adding cheese to a Shellfish dish is wrong it still tastes great! Buon Appetito! will be hooked for life. Below is the video on how to make tomato cream lobster sauce on fettuccini. So if you are looking for a great lobster and pasta dish, here is a great recipe! In A stock pot add 1 tablespoon virgin olive oil and fry the 1/2 cup fine chopped white onion , add the 4 tablespoons pesto sauce, and1/2 tablespoon crushed Italian red pepper cook for 5 min. The next step is to add 20 oz’s of crushed tomato sauce and 1 1/2 oz’s of Kettle One Vodka cook on med. heat for 15 min. Remove the meat from the 1 1/2 pound whole steamed Maine lobster and chop into bite size pieces. Add 3 oz’s of cream and the cut lobster into the tomato cream sauce and cook for 1 more min. Cook the 1 pound of fresh Fettuccini in 2 quarts of water salted until done. Serve the Fettuccini pasta topped with the lobster with tomato cream Sauce. This is a great Italian seafood and pasta recipe. Best Italian Marinara Sauce Recipe thinks they have their Marinara Sauce down pat and Best Italian Marinara Sauce Recipe must always be the best you have ever tasted. The truth is people all have don’t have the same taste buds and what one sauce my hit the spot for one guest but the next guest may find it to be Chef Boyardee’s best. I love this Italian Marinara sauce it’s got a lot going for it! The main thing is making good Marinara Sauce is using a good quality Italian plum tomato imported from Italy, garlic, and basil. This is a very quick and easy recipe to make a pasta sauce that’s not out of a jar yet it will not take you 6 hours to cook. If you start with this 3 basic items in you tomato sauce you can’t go to wrong. I love this recipe and yes it was mighty tasty! This recipe has become one of the most popular on YouTube. When people eat pasta with marinara sauce they are looking for 4 factors sweetness or spicy, chunky or smooth sauce. Marinara sauce tends to be spicier than most other Italian tomato sauces, made with Italian plum tomatoes, garlic, oregano, extra virgin olive oil, basil, and red Italian chili peppers. I have no idea why adding vodka to a Italian tomato cream sauce taste so good, but it does. Vodka Italian Marinara Cream Pasta Sauce is the recipe to make fantastic homemade vodka Italian cream sauce. It’s not hard to cook Vodka Italian Marinara Cream Pasta Sauce sauce and it surely is restaurant quality. 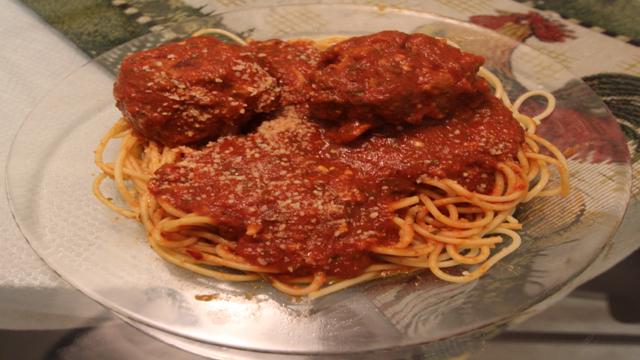 I used to broil my meatballs before I added them to my sauce. Just adding the raw veal, beef, and pork recipe into the sauce keeps them very tender. Just drain of thefat from your sauce before serving your meatballs on any type of pasta! This recipe for Italian meatballs may be one of the best you will find. Try the recipe I guarantee you will love it! In a cuisinart mix the,1 pound of ground beef,1 pound of ground pork, 1 pound of ground veal, 1 egg, and 1/4 cup Italian bread crumbs. Add the 4 tablespoons Italian pesto, and the 1/2 tablespoons crushed Italian red pepper. Form the Italian Meatballs into a nice round shape and drop into your pasta sauce and cook for 1 hour. Easy Chicken Marsala Recipe From Sicily Italy video show you how to make Chicken Marsala. Easy Chicken Marsala Recipe From Sicily Italy recipe is made by the Bald Chef Glen Izett. This is a easy Italian recipe from the town of Marsala in Italy. We will show you how to make this Southern dish. Icluded in this recipe is a complete list of all the ingredients and cooking instructions to make this fantastic recipe from Italy using Marsala Wine. This Italian Chicken dish is about as authentic of a Chicken Marsala rendition you will find. 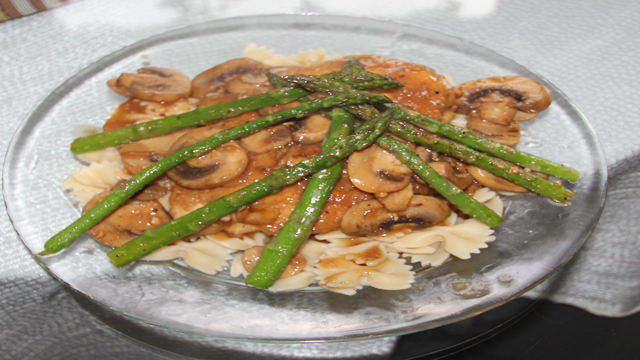 Using Chicken breasts cooked with real Italian Marsala Wine in a Mushroom sauce plated on pasta, this is good eating. This is The Bald Chef’s recipe Chicken Marsala. Take your 2 Fresh Chicken Breasts and pound them out flat with a meat cleaver in a plastic bag. Coat the Chicken Breasts with the 1/2 cup of seasoned Flour mix. Bring up a fry pan to medium heat and add 1/4 cup Extra Virgin Olive Oil. Add the 2 Tablespoons of butter to the cooking Olive oil. Set the pounded , floured Chicken Breasts into the hot oil and butter and cook 3 minutes on each side. After the Chicken breasts are cooked remove them for the oil and set them aside. Drain off about 1/2 half of the oil from the fry pan and add the 8 oz Button Mushrooms , along with the 2 Tablespoons of crushed Garlic. Add 5 Rounds of Black Pepper to the sauce. At this point add 1/2 cup of Italian Marsala Wine. Let the Italian Marsala Wine and Mushroom sauce reduce for a few minutes and return the Chicken and cook on each side for about two minutes per side. Plate one Chicken breast on some freshly cooked Egg Pasta, along with the Mushroom and Marsala Wine sauce. Top with some fresh Blanched Asparagus and you have a winner of a dinner. 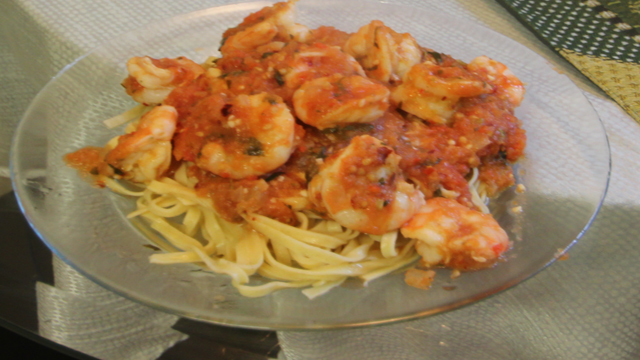 Shrimp Diablo Italian Recipe On Linguini Is an outstanding Italian recipe Shrimp Diablo Italian Recipe On Linguini Italian recipe is a little spicy, that’s why they call it Diablo. Diablo in Spanish means devil or in Italian Diavolo. The Bald Chef shows you how to make Shrimp Diablo on pasta linguini. This is a tomato, and shrimp recipe served on linguini pasta. This is an excellent Italian seafood recipe, and is simple to make. Best Italian Arrabbiata Sauce Recipe is a spicy Italian tomato sauce for pasta The Bald Chef shows you how to make Best Italian Arrabbiata Sauce Recipe spicy sauce that means angry in Italian. This sauce is vegetarian but can be used in many Italian recipes. In this video recipe you will learn to prepare a stand out classic sauce form Italy. The best Arrabbiata pasta sauce is a close cousin to Marinara sauce but just a little more spicy. This is Italian Sunday gravy at it’s finest. Arrabbiata sauce means ‘angry’ in Italian. This is The Bald Chef’s recipe for Italian Arrabbiata Sauce Start by boiling 6 cups of water and add the 10 Italian Plum tomatoes. Cook the 10 Italian Plum tomatoes for 2 min. and remove from the pot and peal the skins from the tomatoes. How To Make Fresh Italian Pasta is how you make fresh egg pasta from scratch. The Bald Chef shows you the basic recipe to make homemade Italian pasta dough, and roll How To Make Fresh Italian Pasta into fresh pasta. The recipe uses Semolina flour, eggs and some virgin olive oil. Fresh pasta will bring any of your Italian recipes up to the next level. This fresh pasta recipe is easy to make and it goes great with many different types of sauce. You can use this recipe to make Angel Hair pasta, Spaghetti Pasta, Fettuccine, lasagna, or Linguine pasta. In a food processer add 3 fresh eggs, 2 cups of #1 Semolina Durum Flour, and 2 tablespoons Italian Olive oil. Turn the food processer on and mix the ingredients until you have a nice dough ball. Remove the fresh pasta dough from the mixer and place in plastic wrap to rest for about ½ hour so that the dough fully dough gluttonizes. Then cut the pasta dough into 6 slices and run them through a pasta roller. This should make thin strips of pasta dough, that you can then cut the ends off. On a clean surface add some more Semolina Durum Flour so the freshly cut sheets of pasta don’t stick together. After you have rolled out the pasta in to thin strips, change the roller to a cutter on your pasta machine. At this point you can then cut your pasta dough into Spaghetti,Fettuccine, Linguine, or any pasta style you want. Now it is time to cook your freshly made pasta. What is the best fresh or dryed pasta check this recipe out and you will know the answer! Many people ask me, just exactly how do you cook fresh pasta? Now I am talking about cooking Italian fresh pasta not Asian or other types of pasta. Or other people ask me just how long should I cook fresh pasta? Well the answer is a little more complicated than boiling water and cooking the fresh pasta to taste. The first step to cooking fresh homemade pasta is to use a large 8 quart pot and filling it ¾ full of hot water and put it on the stove over high heat. When the water in the pot come to a full boil you need to add 2 teaspoons of salt (preferably sea salt), and 2-3 teaspoons of extra virgin olive oil. Fresh pasta does not have a lot of flavor so the salt helps season the pasta while it cooks. The virgin olive oil helps the pasta from sticking together while cooking. Fresh pasta can be made in many shapes and sizes and each has a different cooking time. For example fresh Angel Hair pasta needs to cook for only 1 1/2 minutes where as fresh Spaghetti or Fettuccini should cook for 4-5 minutes. After your salted water comes to a rapid boil add the fresh pasta making sure it is dusted off from any remaining flour, then turn the heat down just a bit on the stove. Cook your fresh pasta until it is cooked al dente. Cooking pasta. Al dente literally means “to the tooth” in Italian. Use a fork or chopsticks and remove one piece of pasta and check it for tenderness, don’t ever over cook the fresh pasta you will only create a mushy mess. Pour the water and pasta from the pot into a strainer to drain into your sink. Don’t ever rinse the pasta because the sauce will not stick to the fresh Pasta. And that folks is how you cook fresh pasta. 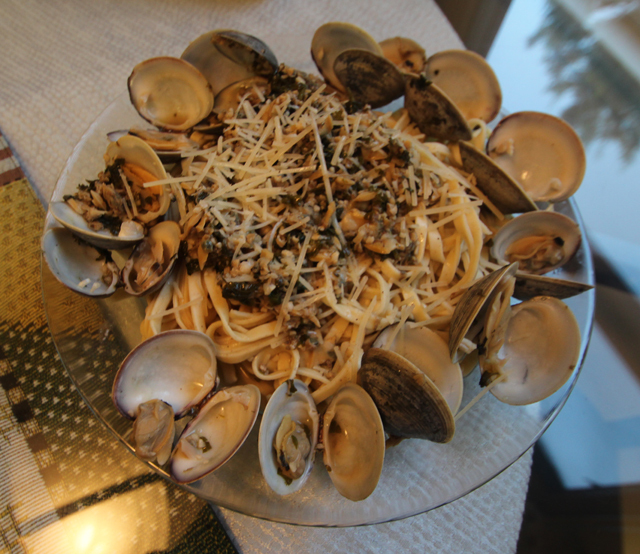 Italian Linguini With Red Clam Sauce is The Bald Chef’s favorite Italian recipe Linguini With Red Clam Sauce. Italian Linguini With Red Clam Sauce is a classic Italian recipe made with a Marinara sauce infused with fresh clam liquor. Crowed with fresh Little Neck clams that are sweet and tasty. The Bald Chef will show you how to make this outstanding Italian pasta dish. Some like their clam sauce white and it’s not to bad. But Italian Linguini With Red Clam Sauce is a much better recipe. The recipe calls for Italian plum tomatoes, red Italian hot pepper, basil, and the garlic make this seafood tomato sauce, oh so much more tasty. To make this recipe for linguine with red clam sauce, you should definitely consider using fresh pasta. Using fresh linguine is quintessential in making this dish restaurant quality. The 2nd most important part to this recipe is defined incredibly fresh little neck clams, will make all the difference in the world. The first step to making Italian Linguini With Red Clam Sauce is to buy some very fresh Little Neck Clams. Remove the clams and wash any sand off the clams in fresh water. Repeat the cleaning of the clams so there is no sand left in or outside of the clams. Take a stock pot and add 1 cup of water, 1 tablespoon of garlic, and 2oz of Italian Marsala wine. Steam the clams until they open, and remove the opened clams from the broth. Set the one cup of clam broth aside. Cook 8 oz of fresh Linguini pasta per instructions, drain and set aside. In your stock pot add 2 tablespoons of oilive oil, and bring to heat add 2 tabelespoons garlic, 3 oz fresh basil, as tease of oregano and 1 oz of fresh Italian chopped parsley. Add the one cup of clam broth and the 28 oz of canned crushed Italian plum tomatoes to the mix. Cook the red – clam Marinara sauce for 1/2 hour. Add the Little Neck clams, and one can of chopped clams and cook for 5 more minutes. Serve the dish with the 8 ozs of fresh cooked egg Linguini topped with 8 little neck clams and 2 ladles of the clam Marinara sauce. Top with a little bit of grated parmesan cheese. The Best Italian Lasagna Recipe will show you how to make the Best Italian Lasagna you ever tasted.The Best Italian Lasagna Recipe shows you how to make great Lasagna step by step. The recipe for Lasagna is one of the most requested Italian recipes on the internet by foodie all over the world. Lasagna comes from the Latin word Lasania meaning cooking pot. 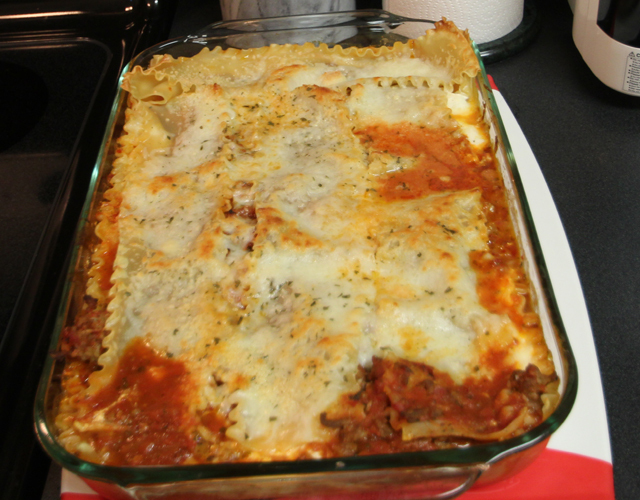 This Italian Lasagna is a baked Pasta recipe and is very easy to bake an prepare. The Bald Chef takes your average Lasagna recipe to a whole new level by adding the best Ricotta cheese, mozzarella cheese, and spicy Italian sauce. After your Lasagna is baked top with more sauce and a little Parmesan cheese for a real treat. To make and bake some of the best Italian lasagna you’ve ever tasted follow this recipe and you will find the results to be very tasty. To start preparing your lasagna you must first cook the Italian lasagna noodles. Don’t use the precooked lasagna noodles go with the Italian brand standard Italian noodle. In a large stock pot add 2 quarts of water, a pinch of salt, and little extra virgin olive oil. Bring the water to a rapid boil and cook the lasagna noodles to the manufacturers specifications. Promptly remove the lasagna noodles and drain them over cold water to stop the cooking process, set them aside. Prepare your meat tomato sauce from scratch, you will find that I have a very good recipe on my site for an Italian tomato meat sauce that would work incredibly well for this recipe. Set your cheese up in a bowl, I like to use mozzarella cheese, I guess that gives the lasagna that stringy look when you bite into it. Use a good quality Ricotta Cheese. Now that all your ingredients have been set up, preheat your oven to 375°. In a Pyrex baking dish 9″ x 13″ place some of the tomato sauce on the bottom of the baking dish. After the tomato sauce has been thoroughly spread to cover the base of the dish start layering the cooked lasagna noodles in an organized fashion on to the baking dish. Alternate noodles, mozzarella cheese, meat sauce, and ricotta cheese until you have built a layered lasagna. Top the lasagna with an extra amount of mozzarella cheese and Parmesan cheese with some finely chopped parsley. Cover this is the lasagna pan with aluminum foil and place into the 375 ° oven. Cook lasagna for 30 minutes and until the cheese is thoroughly melted. Remove the lasagna from the oven and let it rest for 20 minutes before attempting to cut the lasagna and the proportion sized servings. I like to serve my lasagna with a side of extra sauce.